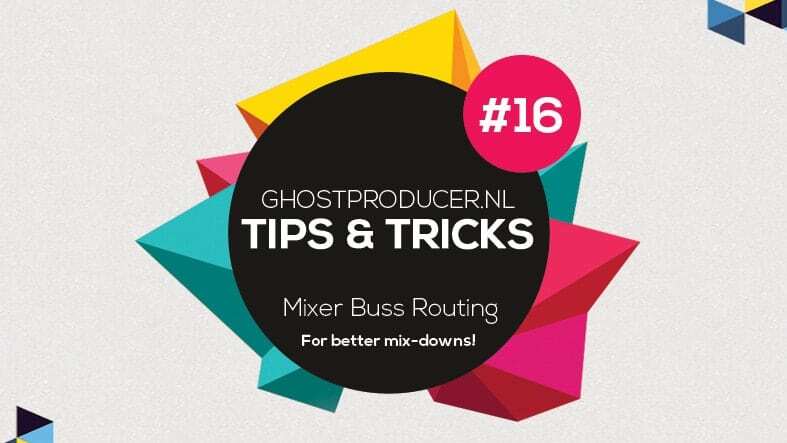 Tip 16 – Mixer Buss Routing for better mix-downs! Kick, Bass, Percussion, Vocals, Pads, Synths, FX, Extra 1, Extra 2, Small Reverb (SEND), Big Reverb (SEND). This means I do not route my separate instruments to the MASTER channel, but to these busses first, before they go to my MASTER channel. This is pretty self-explanatory. This is where I route all of my kicks. Sometimes I use separate transients and low-end information, for my kicks. I will then add some slight compression on this buss to glue them together. Other than that; sometimes a little EQ is in order here, but when possible I try to do it on the instrument itself. This is where I route all of my basses. Both subs as well as the higher end of the bass spectrum. Often I add a little compression to glue them together. Sometimes a little EQ, to tweak all layers of the bass. And sometimes some saturation or harmonic distortion, to make the bass sound a bit fuller. Also sidechaining is often something you’d place on this channel. Although for creative purposes, I prefer to do my sidechaining on the separate instrument channels. The place where all the percussion comes together. Some compression to glue it all together is often a smart thing to do. Taming the peaks, or controlling the dynamics. Other than that; some EQ is in order when you want to process all the layers in one go. For instance, by boosting the high end in the SIDE (with a M/S EQ), you can often give the percussion a more open feeling. In case of an instrumental track, I use this buss solely for some background vocal content. Mainly some vocal shots, pads, maybe some chopped vocals. In the case of a full vocal song, I use this buss for the main vocals, including backing vocals and harmonic content ONLY. I will then route all other vocal elements to one of the EXTRA busses. This is the place where you can glue the main vocals and the backing / harmonies using slight compression. Or you can EQ out some frequencies that might get exaggerated by these layers. Other than that; most of the times I don’t have much effects on this channel. This is where I route all of my melodic atmospheric elements. I usually don’t do much processing on this buss. For pads I try to do all that on the separate instruments. For instance, when Delay or Reverbs from pads are layered, you can get that ‘drowning in reverb’ effect really quickly. You’ll then need to turn it down in the instruments themselves. All of my other synths, plucks, leads, stabs or anything synthy will get sent here. Also, some slight compression for the glue effect could be in order. Maybe some EQ to subtly tweak the buss as a whole. Usually all my effects on this channel are very subtle though, since both the quieter synths from the breaks as the louder synths from the drops are sent here. In case I really need to process some of these synths together, I split up the busses and create another subgroup for my separate drop synths. Crashes, Atmospheres, White Noise, Reverse synths, impacts, fills. Everything that remotely resembles effects of any sort get sent here. Usually without much processing. Sometimes a slight cut on the highs (when the white-noise stacks up), or a slight dip in the lows. Ideally this is all done on the separate instruments though, so this buss won’t need much processing. These busses are what I use for any instruments or sounds to do not fit, or go well, with the other sounds. Especially in the case of using ‘real’ instruments in a track, I prefer to keep them separate from the other instruments. Think of guitars, strings (cello, violin), trumpets, saxophones etc. I hardly ever process these busses, just the separate sounds. Now here’s where things get interesting. What’s this SEND thing you ask? Well, this is where I route instruments that need a touch of reverb, while I also route these instruments to the main mixer busses. On this channel I have both a reverb effect, with a small reverb / decay / size timing and often a bit of a pre-delay, that’s 100% WET. I often also have an equalizer on here, to EQ this reverb. Sometimes it includes a saturation plugin as well, to make the reverb a bit warmer. To give you an idea of the use; We can put a reverb effect on every single instrument that needs it. But it would both take up a lot of CPU, as well as result in a lot of reverbs with different settings. This will quickly stack up and make your mix sound muddy. So, think of a clap that needs a little bit of reverb. I will then send this clap to PERCUSSION buss, but also to the SMALL REVERB buss. I can tweak the volume of the routing to the reverb buss in order to determine the amount of reverb. Best of all, I can send all instruments that need a bit of reverb through this buss. Win! This buss is set up exactly the same as the buss before with the exception that I use a reverb effect with a long reverb / decay / size timing, making it sound very atmospheric. So any sounds that could use some atmospheric reverb effect will get sent here. Think of Crashes, pads, vocal FX, other FX. Etc. etc. Lastly, I often add a sidechaining plug-in to this channel as well as the last plug-in in the chain. I automate it to turn on in the drops only. Just to be sure the drop won’t drown in any atmospheric reverb when I need it to be crisp and clean. So, that’s it for now. Hope this tip helps you with your tracks. Happy producing! And if you need any help, you know where to find me!